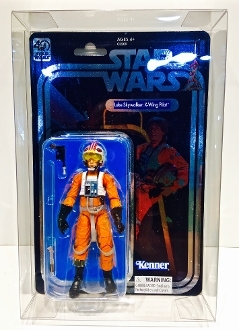 1 very heavy duty protector specifically made for the Celebration Luke X-Wing. The card on this one is just a hair wider so it doesn't fit properly in standard ones. This one was made with even thicker plastic too! The value of the X-Wing is so high that we wanted to make this one even sturdier. These will work with all the others except for the R5D4 which has a deeper bubble. It will just be a hair looser on the width but a very nice fit if you want your standard ones in these thicker protectors. Since the plastic is so thick the back may bow out just a bit but we include 4 clear round stickers that will seal the flaps and solve that issue. If you work the creases well before inserting your figure that will help too.